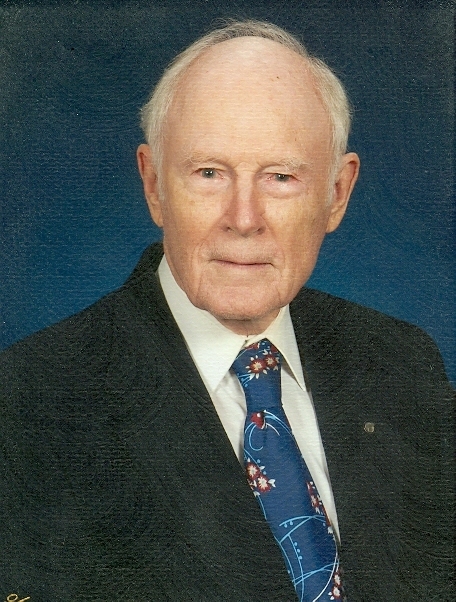 Edson L. Tennyson, 1922-2014. Photo: Tennyson family. With profound sorrow we have learned of the loss of our close colleague, the renowned transit industry icon Edson L. Tennyson. Shortly after his 92nd birthday, Ed, senior technical consultant to the Light Rail Now Project, passed away at his home near Washington, DC on 14 July 2014 following a valiant struggle with cancer. He intrepidly had continued to post his insights and analysis of transit issues on the LRPPro listserve, to the benefit of hundreds of colleagues belonging to younger generations of rail transit advocates and professionals. Two of Ed’s daughters, Marilyn Tennyson and Marjorie Tennyson, were with him in his final days. He is also survived by another daughter, Connie McCarthy, and by his wife of 70 years, Shirley Forward Tennyson. Services will be held on Tuesday, 22 July 2014 at 2:00 PM at the Vienna Presbyterian Church in Vienna, Virginia. In postings on the LRPPro listserve, Ed often cited his youthful experience riding the once-extensive electric trolley system of New Jersey Public Service, mainly in northern New Jersey. He also drew upon lessons from his stint as a station employee for Greyhound. After completing two management engineering degrees, Ed began his main public transport career at Pittsburgh Railways, subsequently moving to a management position with Milwaukee Rapid Transit. There, as described by Lawrence Lovejoy, a Senior Supervising Engineer for Parsons Brinckerhoff, Ed was particularly involved with developing the Speedrail system, an effort to reorganize remnants of the Milwaukee region’s once-extensive interurban system into a suburban rapid transit service. 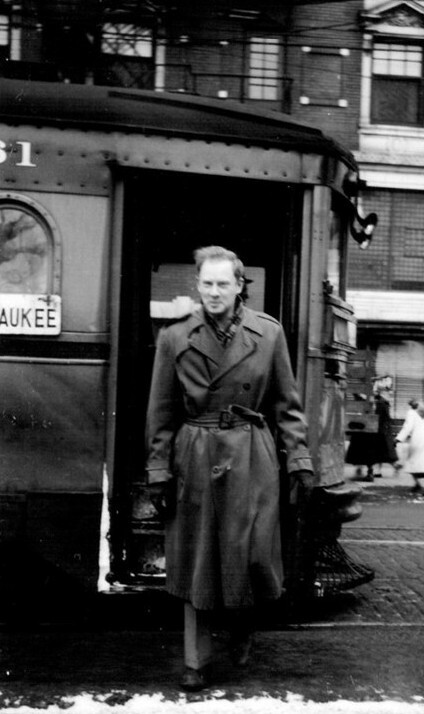 Ed Tennyson stepping from a Speedrail electric interurban car, c. 1950. Photo: Arthur S. Ellis and the Miller Library of the Pennsylvania Trolley Museum, via Lawrence Lovejoy. While Ed’s formative experience was gained in the course of a largely unsuccessful struggle to retain electric rail and trolleybus operations during the U.S. Transit Devastation era, his understanding and insights have proved invaluable to colleagues, and influential in the revival of electric surface railways over the past four decades. In 1951 Ed was appointed City Transit Commissioner for Youngstown, Ohio, championing the city’s electric trolleybus system which remained in operation until 1959. He served Youngstown until 1956, when he became the Chief Transit Engineer and Deputy Commissioner of Transportation in Philadelphia. When other cities were ripping up street railways and building urban highways, Ed was key to crafting Philadelphia’s policy to eschew the temptation of cheap federal dollars for roadways and focus on preserving rail transit through what we today accept as public-private partnerships with the railroads and then-private transit companies. He is one reason … that Philadelphia is still by far the largest street railway operation in the US. He extended the light rail “Subway-Surface” tunnels under the Schuylkill River lines and University City to their present portals. In rail rapid transit, he extended the Market-Frankford El to 46th Street at the same time as the Subway-Surface extension. The “Almond Joy” el cars were purchased under his watch as well. He led the extension of the Broad Street Subway to the Sports Complex in South Philadelphia. He was highly influential in the creation of PATCO [Port Authority Transit Corporation] — both in extending the predecessor Bridge Line under the streets of Philadelphia from 8th & Market to 16th & Locust and in splitting the Lindenwold High Speed and Broad Street Lines into the configuration we know today. As for commuter rail, Ed formed the Passenger Service Improvement Corporation in the late 50s with the then-unheard of proposition of giving public money to private corporations (the Pennsy and Reading) as reimbursement for the losses incurred in commuter rail service, as well as providing new rolling stock to do so (Silverliners I, II and IIIs plus RDCs for the Reading diesel lines). He was the force behind linking Philadelphia’s two commuter rail networks through the Center City Commuter Connection, as well as the Fox Chase electrification, Airport High Speed Line and retention of the PRR Norristown Line as far as the City limits (Ivy Ridge). He grasped immediately the idea that German light rail, which evolved from streetcars in Germany, was a new transit mode faster, higher capacity, and more productive than both buses and traditional streetcars. He understood that for those reasons light rail could be configured as the backbone of regional multimodal transit systems that attracted high ridership and were productive. Ed tirelessly advocated the potential of Pittsburgh’s streetcar system, fighting not just against its abandonment, but for its reconfiguration into trunk lines. What has remained would not have remained had Ed not carried on the good fight. He also researched the relative performance of busways in that city, revealing the chasm between what they promised and what they actually delivered. High among Ed’s other achievements in his Deputy Secretary position was to improve intercity rail service — particularly “resuscitating Keystone corridor rail service between Harrisburg and Philadelphia”, according to Greg. When his term with PennDOT expired in 1979, Ed moved on to a role as consultant for the new San Diego Trolley project, helping to guide startup operations there, and with several other transit entities. Then, in 1983 he was appointed Public Works Planning Coordinator for Arlington County, helping to complete the Metro Orange Line to Vienna, Virginia. Following that, in 1992 he retired — nominally. But in reality, Ed stayed very active as an advocate and advisor to others pursuing important public transport projects, especially rail. In 2000, he was one of the original members of the Light Rail Progress Professional (LRPPro) listserve, an online forum where his analysis and advice have been of enormous value to other professionals and advocates striving to develop and improve rail public transportation. In recent years, he served on the Fairfax County Transportation Advisory Commission, and as an emeritus member of the Transportation Research Board of the National Research Council. Until a few weeks before his death, Ed was working with engineering consultant (and LRPPro member) Alan Drake on a proposal for expansion of Washington’s Metro system. Ed was a determined, tireless, and often effective advocate of doing things right. He was eternally generous with his opinions (even when unsolicited…) and always challenged those around him to extend their reach. My deepest condolences, and he already has left a hole in the fabric of the transit community. I knew Ed professionally and as a friend for well over 25 years and he was never anything but the consummate gentleman. Again my deepest condolences to the family; you will all be in my prayers. Ed has been my most influential mentor. I will miss his advice, wisdom, and inspiration more than I can express. Edson Tennyson was a great friend and mentor for the last 23 years. He was foremost among those who sought to bring back a rational transportation system to America, the professor emeritus of public transit, and in that effort he inspired the rest of us to make the world a better place in every way. I will miss his sage advice, his insights and his careful analysis of the all important numbers that he so enjoyed presenting to the world. LRPPro, started by Lyndon Henry, grew out of our website, LightRailNow! (www.lightrailnow.org), which Ed inspired with his charts, graphs and commentary that he presented at the Dallas Rail-Volution in 1999. I had the honor of converting those incredible materials into electronic format, which, in 2000, became a website that now has thousands of pages and numerous articles by Edson Tennyson and is used by many in the transit industry for information. Lyndon Henry, Roger Baker and I and others here at TAPT offer our condolences. Please know that while your personal loss is immeasurable, our loss and the loss to the transit industry is shared with you in a very keen way. Ed was one of the greatest generation; a soldier right up to the end, he continued to give to his country and the world. May he rest in peace and may you find peace in knowing how much Ed meant to others. I shall miss him, but I also am comforted in the fact that his work is responsible for the industry being on a plane higher than it would have been without him.